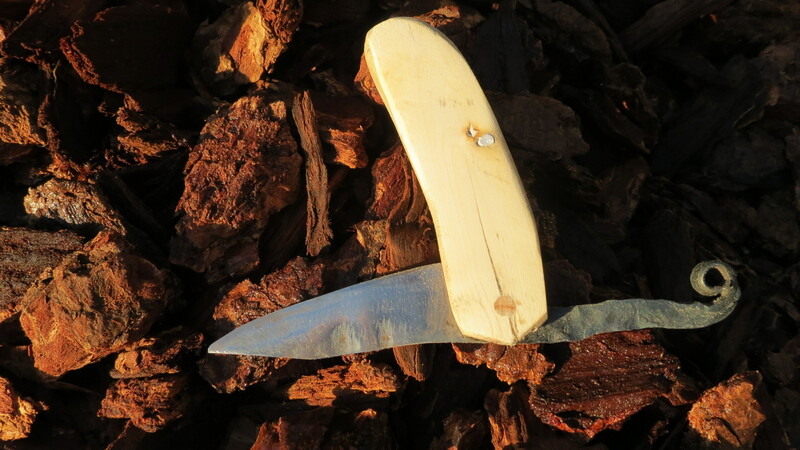 The Bladesmith’s Shop: Past, Present, and Me. 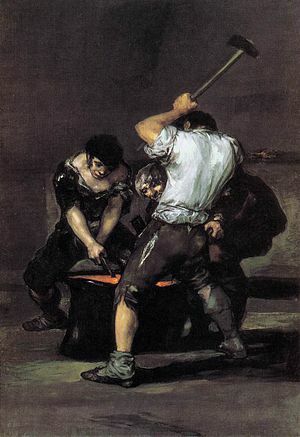 Many of you probably think of a smithy as dark, very smoky, with a huge bellows and coal forge, and a burly blacksmith pounding away on an anvil. 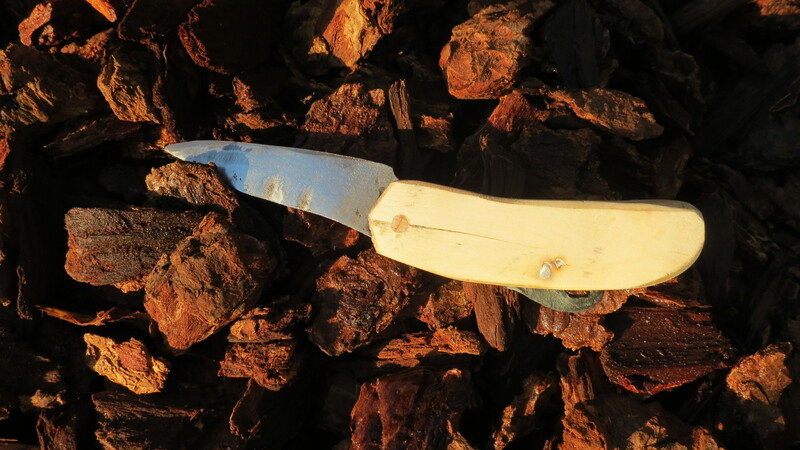 That may have been true at one point in time, and it still is in several places, but the modern bladesmith, though still using the same techniques, has slightly different tools. Here’s a list of some of the more essential tools, along with the version of those tools used in the 1800s, and also what I currently use. Forge, or heating source. Modern smiths normally use propane forges; which is basically a rounded tubular cavity and a torch blowing in from the top or side. The rounded sides swirl the flame and keep it in the forge, and so heats up the steel very quickly.In the 1800’s a coal forge was used. 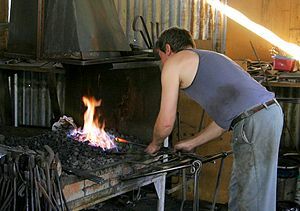 Many modern smiths use coal as well, but most have switched to a propane forge because of the ease and the smell. A coal forge consisted of a type of basin, filled with coal, but with a hole in the bottom for an air source. Through this hole air is pumped which increases the heat of the flame. I myself use a propane forge, which I made from a soup can, plaster of paris, sand, and a propane torch. I’m currently making a bigger one from a paint can. Anvil: a surface to pound on. 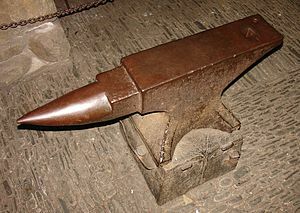 The anvil is said to be the only tool a blacksmith cannot make himself. The anvil has not changed in hundreds of years. 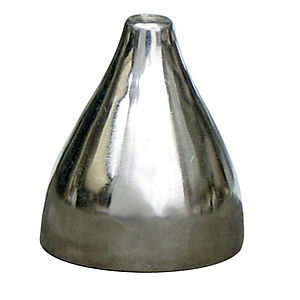 Normally it is forged out with huge machines, or specially cast the heat treated. I myself have been hunting desperately for a good one. What I use for a substitute currently is an old sledgehammer head. Many smiths who cannot find or are too cheap to buy a commercial one (seriously, a good anvil will average $500-$700) use small sections of railroad track, as they are both hard and strong. Seriously though, any of you who are local, lemme know if you have an anvil your great grandfather left to you or something. *sigh* I wish I lived in the 80’s; according to the movies made then, anvils fell on people regularly. hand forged by a blacksmith from an antique shop, for only five bucks! Really these two types of hammer are all that are needed. hammer. 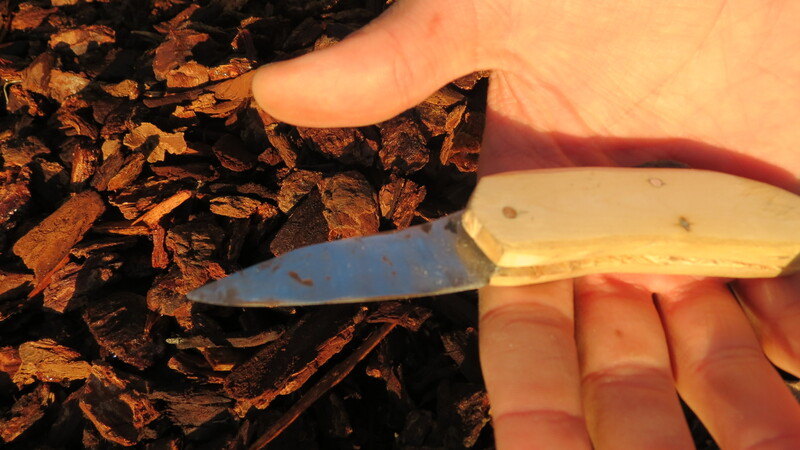 Because of this, the edges were normally not very straight and were pretty uneven. 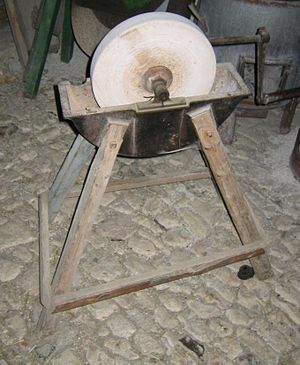 If grinding were to be done, a grinding wheel would be used (right). 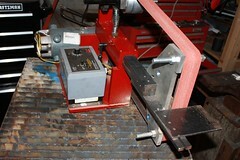 Modern smiths use a motor-powered system, normally a Belt Grinder. A belt grinder is powered by a motor, and pulls an abrasive belt over a series of wheels, sort of like a escalator, albeit an escalator at a couple thousand RPM. Now MY grinder is what I call, “Ingenious” and “redneck”. I use an angle grinder held upright in a vise. Nice and secure, I use a face mask and heavy duty gloves to hold my workpiece. I’m hoping to upgrade once I get the money, but for now, it does the job. to hold things, the quality does not have to be a big factor. Most smiths make their own tongs, so they can specifically fit things to their own preferences. I’m currently working on a pair myself, but until then, I’m using a large pair of pliers. They’re basically the same thing. So there you have it: The basic tools of a bladesmith. Past, Present, and Me. It does look pretty simple and easy to get these (excepting the anvil AUGH!! 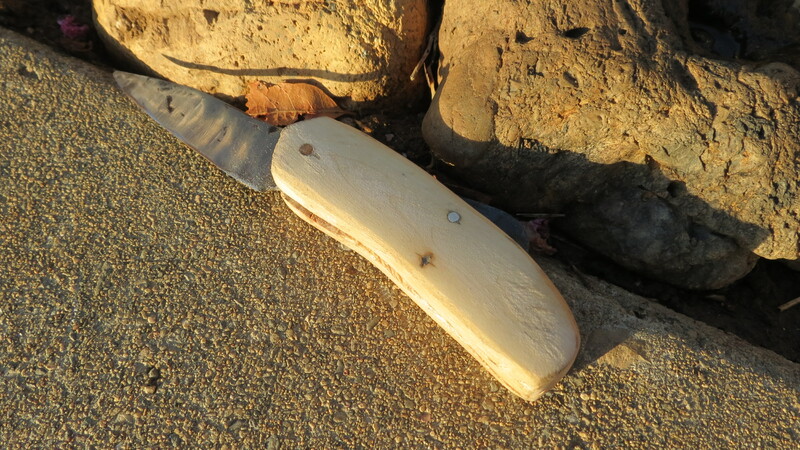 ), but remember, what makes a good knife is not the tools, it’s the skill and knowledge of the smith. Thanks for reading. This entry was posted in Uncategorized on September 25, 2013 by Captain Belaq. Most welding (fusing two pieces of steel together) nowadays is done with welding torches, such as TIG or MIG torches. Torches such as these melt both steels whilst a third metal (normally in the form of a rod) is melted into the cavity. Forge welding was mainly done in the 1800’s, before torches of that heat were invented. Still today many bladesmiths use the ancient technique to weld bars of steel together to make patternweld, or damascus, steel. In forge welding damascus, the individual bars of steel are laid one on top of the other and given a simple weld with a torch to keep them all together. This stack, called a billet, is then placed into the forge to get up to welding temp. Every few minutes, the bladesmith takes the billet out of the forge and sprinkles a flux (normally Borax) over the hot surface. The flux melts, and flows between the individual bars, keeping the oxygen out of the way. Once the metal is up to welding heat (where the steel looks like it is just barely melted; looks shiny and almost watery) the smith forges the billets together with heavy whacks of the hammer. The force and incredible heat cause all the bars to fuse together, and are completely welded into one firm billet. The smith then forges out the bar, twists it, cuts it, and does whatever is necessary to get a beautiful Damascus pattern in the steel. This entry was posted in Uncategorized on September 18, 2013 by Captain Belaq. Alloy Steels- What Do The Numbers Mean? In the bladesmithing world, there are a lot of different types of steels being used, and they are referred to as numbers- the type of steel I commonly use is 5160 steel, from an old car spring. 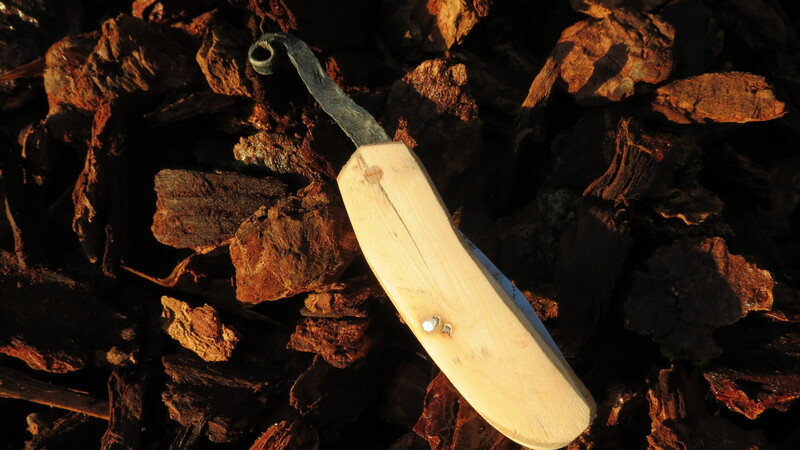 Other common steels used in bladesmithing are 1095, 10520, etc. 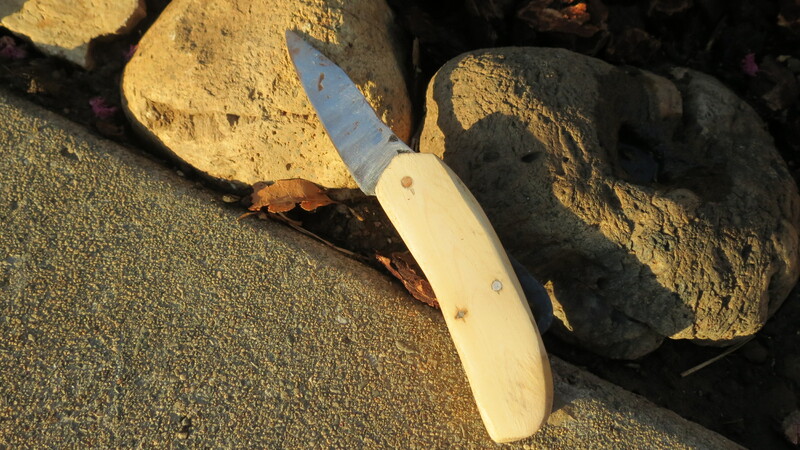 These numbers always have confused me, so I asked questions around a bladesmith’s forum, did some research, and I think I have the answer. The first number refers to the type of alloy the steel is. The chart below shows which number refers to what alloy. For example, 5160 is a Chromium alloy, and 1095 is a plain Carbon steel. The second number refers to what percentage (by weight) of that element is in the steel. For example, 5160 has approximately 1% Chromium. 5260 would have about 2% Chromium. The last two numbers show what percentage of the steel is Carbon. The point is always two digits from the end of the number; 5160 would be .60% carbon. In total, 5160 is around 1% Chromium, .60% Carbon, with the rest Iron. Often there are a few other trace elements added, such as Nickel, but the numbers refer to the majoring elements in the steel. If the steel is a plain Carbon alloy, like 1095, the second digit refers to a little more than just the carbon content (that’s the job of the last two digits) and that gets a little complicated, but if there’s just a zero there, it turns out nuetral. So for some practice: 52100 has 2% Chromium, 1.00% Carbon. 2380 (I’m making this one up btw) would have 3% Nickel, and .80% Carbon. 4037 steel is actually a trick one, as the 0 indicates there is, well, 0% Molybdenum, and .37% Carbon. This entry was posted in Uncategorized on September 10, 2013 by Captain Belaq. Now in this post, I’m not talking about the planet Mercury, nor the Roman god. In fact, the god Mercury had the nickname “quicksilver”, which was the old name for Mercury. He was called quicksilver because he was said to have fluid, silvery motion, just like quicksilver. The god had the name Mercury first, so eventually the element was just named Mercury. Mercury is one of the only totally metallic elements that are molten at room temperature (if you freeze it, it would have about the same properties as Aluminum), and so are, or were, very fun to play with. Mercury is very dense, and so when one sinks one’s hand into a bowl of it, one can feel the pressure squeezing in on the hand. Unfortunately though, Mercury is toxic, and attacks the brain functions, meaning you’ll go nuts. Literally. It was only about 60-100 years ago that it was discovered that Mercury was poisonous, and it sure was disappointing. 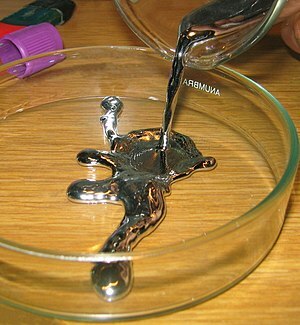 Imagine playing around with that silvery fluid. Before it was discovered that it was toxic to the brain, kids on factory tours used to stick their whole arm in a barrel of the stuff. Too bad I’ll never be able to experience that *sniff*. Have you ever heard of the term “Mad as a hatter”? This is because Mercury used to be a common product in creating the red tints in hats. Hatters were in contact with Mercury quite a lot, and thus were, well, mad as a hatter! This entry was posted in Uncategorized on September 4, 2013 by Captain Belaq. Here’s a list of 20 of the top bladesmiths, not really in any order. This entry was posted in Uncategorized on September 3, 2013 by Captain Belaq.